Simply Elegant!! 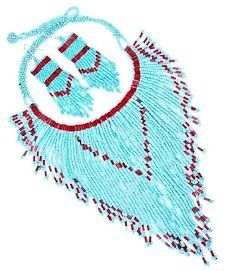 This hand beaded necklace and earrings set is artistically created with hundreds of turquoise blue and red seed beads into a handsome arrow design with a beaded ball and loop for closure. Earrings are completed with hypo-allergenic earwires. Length is 16.5in (41.9cm) and max. width is 6.6in (16.8cm). This product was added to our catalog on 10/13/2018.